MELIA was the Okeanid-nymph of the Ismenian spring of Thebes in Boiotia (central Greece). She was loved by the god Apollon who slew her brother Kaanthos (Caanthus) in the contest for her love. She bore the god two sons, Ismenos and Teneros--prophetic priests of the oracular Ismenion shrine. Melia as the Naiad-nymph of the Ismenian spring occurs in two alternate traditions as Melia and Ismene, ancestresses of Kadmos (Cadmus), the hero-founder of Thebes. "[In Thebes :] The shrine of Melia, to the treasure-house of golden tripods, the temple that above all others Apollon held in honour, and he named it the Ismenion (Ismenium), the seat of prophecy that known no lie." "By some might divine have I been prompted, hard by the immortal couch of Melia, to compose, for your sake, a noble strain with my flute . 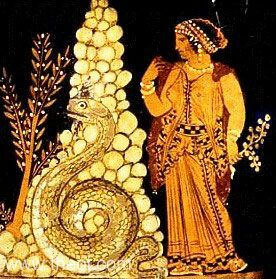 . . Thine oracular shrine, Apollon; there it was that Melia, the daughter of Okeanos (Oceanus), wedded to thy couch, O Pythian god, bare mighty Teneros (Tenerus), the chosen interpreter of thy decrees." "Shall we sing of Ismenos (Ismenus), or of Melia with her golden distaff . . . or Thebe with her purple snood." "[Verse of Pindar :] Gold-distaffed (khrysalakatos) Melia." "The Teneric Plain [in Boiotia] is named after Teneros (Tenerus). In myth he was the son of Apollon by Melia, and was a prophet of the oracle on the Ptoüs Mountain, which the same poet calls three-peaked : ‘and once he took possession of the three-peaked hollow of Ptoüs.’ And he calls Teneros ‘temple minister, prophet, called by the same name as the plains.’"
"By this fountain [the Ismenian spring of Thebes beside the sanctuary of Apollon Ismenios] is the grave of Kaanthos (Caanthus). They say that he was brother to Melia and son to Okeanos (Oceanus), and that he was commissioned by his father [Okeanos] to seek his sister, who had been carried away. 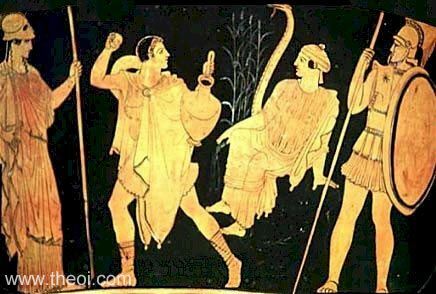 Finding that Apollon had Melia, and being unable to get her from him, he dared to set fire to the precinct of Apollon that is now called the sanctuary of Ismenios. The god, according to the Thebans, shot him. Here then is the tomb of Kaanthos. They say that Apollon had sons by Melia, to wit, Teneros (Tenerus) and Ismenos (Ismenus). To Teneros Apollon gave the art of divination, and from Ismenos the river got its name. Not that the river was nameless before, if indeed it was called Ladon before Ismenos was born to Apollon." "On the right of the sanctuary [of the Kabeiroi (Cabeiri) near Thebes in Boiotia] is a plain named after Teneros the seer, whom they hold to be a son of Apollon by Melia."